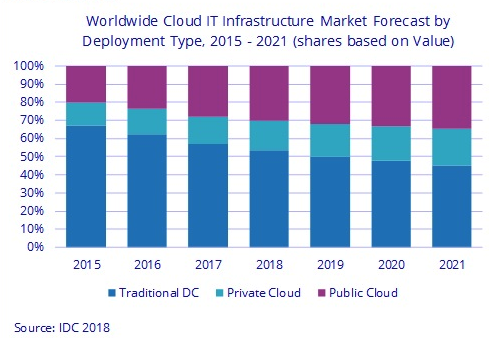 Public cloud data centers will account for 65.3 percent of this spending, growing at the annual rate of 26.2 percent over the IDC forecast period. Hosted off-premises private cloud environments will represent 13 percent of cloud IT infrastructure spending, growing at 12.7 percent year-over-year. On-premises private clouds will account for 62.6 percent of spending on private cloud IT infrastructure, and will grow 11.5 percent year-over-year in 2017. Worldwide spending on traditional -- i.e. non-cloud -- IT infrastructure is expected to decline by 2.6 percent in 2017, but will still account for 57.2 percent of total spending on IT infrastructure products -- that's down slightly from 62.4 percent in 2016. This trend represents a faster share loss than in the previous three years, according to the IDC assessment. Moreover, the growing share of cloud environments in overall spending on IT infrastructure is common across all regions. In cloud IT environments, spending in all three technology segments is forecast to grow by double-digits in 2017. Ethernet switches and compute platforms will be the fastest growing at 22.2 percent and 22.1 percent, respectively. Meanwhile, spending on storage platforms will grow 19.2 percent. Investments in all three technologies will increase across all cloud deployment models – public cloud, private cloud off-premises, and private cloud on-premises. Long-term, IDC expects spending on off-premises cloud IT infrastructure will grow at a five-year compound annual growth rate (CAGR) of 12 percent, reaching $51.9 billion in 2021. Public cloud data centers will account for 82.1 percent of this amount growing at a 12.1 percent CAGR while spending on off-premises private cloud infrastructure will increase at a CAGR of 11.7 percent. Combined with on-premises private cloud, overall spending on cloud IT infrastructure will grow at an 11.7 percent CAGR and by 2020 will surpass spending on non-cloud IT infrastructure. Spending on on-premises private cloud IT infrastructure will grow at a 10.8 percent CAGR, while spending on non-cloud IT (on-premises and off-premises combined) will decline at a 2.7 percent CAGR during the same period. 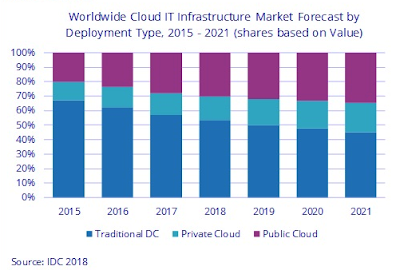 "As adoption of public cloud services and private cloud deployments continue to spread around the world replacing traditional on-premises hardware-centric IT settings, overall market spending on servers, storage, and networking will follow this move," said Natalya Yezhkova, research director at IDC. "The industry is getting closer to the point when cloud deployments will account for the majority of spending on IT infrastructure, which will be a major milestone embracing the benefits of service-centric IT."